Dixie is a sweet calm girl. She is very interested in everything. She is very smart and gentle. Sophie is a sweet girl, she just wants to be near you and get loved. 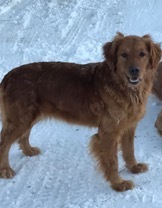 She is one of our puppies from our now retired golden retriever Peanut's very last litter. She has her mother's willingness to please. Sophie has a non shedding smooth coat. Dan is a very sweet boy. He can be very silly and fun. He craves affection and is very loving. Kelly is a fun, goofy girl. She is always ready to wrestle and play. She loves to run. She is very sweet and gets along with everyone. She is a beautiful dark red. Leo is the happiest poodle you will ever meet. He loves to be loved and it makes his day to be called "Good Boy". He is such a sweet gentle little man. There is not an aggressive bone in his body, he gets along with everyone. Cinna is a very fun girl. She loves to fetch and is usually carrying a toy around just incase you want to throw it. Tennis balls are her weakness. She is very smart and loving. Cocoa is our peacemaker, she is friends with everyone. She is always quietly waiting her turn and is very happy to just hang out.